1. I think you're not looking at the political economy of this. From your account, pay cuts are a good thing because they are an egalitarian measure to bring academic pay closer to the national average. Of course that's not the motivation of the university administrators pushing the cuts. They want to push wages down as much as they can get away with in order to, for example. pay for the high visibility infrastructure projects that bring in rich donors. Furthermore I disagree with the idea that just because some people are paid less (or have worse conditions) elsewhere that means they should be lowered here. That is exactly the kind of neo-liberal rhetoric that wants to get rid of good public sector pensions and wages because "why should they make more than the private sector?". The consequence (and indeed the aim of those pushing this rhetoric) is that everyone's wages and conditions end up being lowered, everyone except of course a smaller and smaller elite. Academics refraining from strikes will therefore not lead to a more egalitarian society, it will only form part of a wider trend towards the erosion of working conditions across society for the benefit of an elite. 2. You say that "if you don’t like it, do something else!" This is not a question of liking it or not, but whether young academics can survive (or at least live decently) on their wages. If they cannot, then the likely consequence is that only those who have external support (i.e. rich parents) will be able to bridge the gap between graduate study and finding a permanent job. Hence creating a further hurdle for people from poorer backgrounds getting into academia. Low wages are much less of a worry if you a young promising academic, likely to get a permanent job after a year or two. It is much more of a worry if you happen to be a single-parent and have no guarantee that even if you somehow make it through a few years will still get a permanent job. You're first response seems off the mark to me. I agree that the motivation behind the cuts is not a benign one, but its not clear to me in what way the intentions of university administrators should bear upon the matter. The question is 'Is there a good justification?' not 'Do they give a good justification?' The answer to the question that we care about is that there might be. Similarly, the point about pensions seems off the mark. The claim is not that academics do better than others (as is the case in the pensions example), it is that academics do better than they would do in a more just society (as is probably not the case in the pensions example). I do see the force of your second point, though. I'd be interested to see the empirical evidence, if there is any, on how graduate teaching pay affects the numbers of academics coming from poorer backgrounds. My sense is that other factors (such as prior education and the availability of scholarships and grants) will prove much more decisive, though. Tom, thanks for the thoughts. I was hoping to put to you an idea that sits somewhat away from the kind of arguments you consider here, something more along the lines of structural power and change. 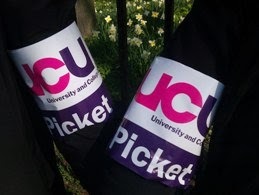 I think you are right that a strong case can be constructed about the wages of non-academic staff at universities and even if UCU does not represent such individuals, I wonder if the situation of these groups, perhaps at least their bargaining power, is improved by a social movement that pushes for changes elsewhere. I guess such an argument would need empirical support, but it seems to be an idea common in the history of industrial action that there is a chain effect of this kind, that there is greater strength in united campaigns. Do you see much mileage in the thought? This is not about whether motivations matter morally or not. This is about intentions revealing the underlying political/economic forces driving the lowering of wages. Not understanding those forces means that you inadvertently end up supporting the neo-liberal agenda of lowering wages and weakening labour conditions and job security. It fails to recognise that administrators (and companies generally) will not be satisfied with pushing down wages until they reach a "just" level. They will keep lowering them until individuals won't (or indeed cannot) work for that pay or they are stopped by collective action. Worth noting that at least the first few strikes (as far as I know) were joint strikes with UNISON and Unite members also taking part. (1) a just and efficient state introduces higher taxes on all university employees who make (significantly?) more than the national average, and then redistributes the revenue to the worse off members of society. (2) management introduces measures that in fact increase inequality in pay both within the university and in the larger society. Strikes are about a case like (2), not (1). (Sure, in an ideal world we should probably all be striking for a lot more equality society-wide). And I just don't see why – other things equal – should one think it is legitimate to be made worse off by a private agent in a process that increases injustice. How much better off one is in the first place, compared to how they ought to be, is completely irrelevant. Tom, in your response to Bruno you write that 'academics do better than they would do in a more just society'. What makes you think so? More generally, how do we judge whether one does better, worse, or just about the same as one would do in a just world? 1) do you see academia as one big category, or could there be different categories? Is it the same kind of "expensive taste" to do research on Shakespeare's early sonnets and on a cure for breast cancer? 2) does it matter for your argument whether or not, in a perfectly just society, there are universities with decently paid academics? Do they have departments for research on Shakespeare's early sonnets and on cure for breast cancer, or only the latter? 3) do you think there is any point in thinking about the justice of specific incomes, for specific tasks, at all, or do you think all that matters is the overall distribution? If it is the latter, do you accept arguments about attracting certain people into certain jobs (i.e. from a purely functional perspective, given that these people might not be sufficiently motivated by a sense of justice (or whatever else) to do the things they are talented for, but which take an effort, for the same salary as others)? Thanks for your post, Tom. Setting aside the question whether and how campaigns for better pay in academia may contribute to achieving greater social justice overall, how would you react to the suggestion that fair pay represents a moral concern that is best understood as independent of more general concerns of social justice? I suppose this partly relates to Lisa's third question. One may think, for example, that the question of fair remuneration arises from a perspective that is 'internal' to a given industry and concerns the way in which benefits and burdens are distributed among different actors in that industry. Following this line of thought, it may be argued that even employees with salaries that are way above the societal average can have a legitimate (pro tanto) complaint if their salary appears disproportionate to their productive contribution or disproportionate in relation to the salaries of other participants (e.g. senior managers, or university presidents for that matter). The concept of exploitation may provide a useful frame of analysis for this kind of scenario. As far as action-guidingness is concerned, the question, of course, would be how such an internal concern fares in relation to potentially competing concerns of general social justice – ideal and non-ideal theory may lead to different answers to this question – but at least the concern itself could be spelled out in a morally coherent way. Bruno: Though I am (of course) sceptical of the neo-liberal agenda, my thought is that it may unintentionally involve some justifiable amendments. We should be careful not to oppose neo-liberalism on dogmatic grounds and, instead, be sure that we objects only to those parts of it that are unjustifiable (which, of course, happens to be most, though perhaps not all, of it!). If academics had their wages pushed down significatly such that a genuine injustice was to arise, this would be a different case and one in which I'd be much more sympathetic to industrial action. Anca: It's a good question and one that I've no satisfactory answer to. If I'm honest, I'd assumed that it relatively uncontroversial that many academics do much better now than they would do in a just society. This might not be true of academics earning salaries of 30k (although I in fact think it is), but I think it is more clearly true in the case of those academics earning salaries of 40k+ (which would put them pretty near the top of the income distribution). Do have a simliar sense on this question or not? Thanks both. Yes, I think there certainly could be some mileage in this idea, empirical evidence pending. Even if correct, though, I think it would be helpful if we were clearer about this being the motivation for supporting the strikes. My sense is that this motivation doesn't play a significant role in the reasoning that most academics (perhaps outside political theory!) give for their support of the strikes. And, this is important because it means that the kinds of changes that we are interested in are unlikely to feature centrally in strike negotiations. Thanks, Anca, this is helpful. I'm not sure, though, to what extent the higher education pay disputes are like case (2). The UCU's principal objection is not to the increased wages on VCs (that is, I don't think the strikes would end if VCs agreed not to accept pay increases); rather, it is to not receiving a pay increase. In this sense, the UCU is not at all concerned with the inequality between academics and larger society. This is the core of my objection. On the second point, its not obvious to me that we're talking about 'a process that increases injustice'. The very point that I'm denying is that it is an injustice. If you have X but are not entitled to it, then I'm not sure that you can have a complaint if I take X from you, even if I'm not entitled to X. Rather, the just owner of X is the one who has the complaint (against you for having X, and now me for failing to redistribute it to you). That's really interesting, Lisa, and they're questions that I haven't thought about enough. I'm instinctively against treating the two occupations too differently. This in part reflects (i) my scepticism about desert as a normatively significant concept, and (ii) the fact that I believe that lots of medical research is over-financed. We may, though, want to treat them differently for incentive reasons: I take it that we do want some people to research cancer and incentives may be necessary for this (whereas I'm not convinced that we want Shakespeareans in this way also). However, its not clear to me that there's a shortage of people wanting to research cancer and I'm not worried that this will happen if wages continue only to increase at 1% a year. Thanks, Tom. You write that 'its not obvious to me that we're talking about 'a process that increases injustice'.' I was assuming – maybe incorrectly, this is an entirely empirical claim – that the failure to address the fall in academics' pay is part of a process of widening the wage inequalities, nation-wide. What do you think the complaint consists in? Is it that they no longer have the good or is it that those truly entitled to the good don't have it? If the former, then I don't see the force of that claim. What's the reason or argument underpinning that complaint? If the latter, then issues of hypocrisy and standing arise. It's not always that case that I can blame you for failing to do X if I similarly failed to do X (because I may lack the moral standing to do so). Note I don't believe that strikes in higher education are well modelled by the above example, for a number of reasons. (Do you?) But even if they were, I don't think they'd be objectionable. What is points towards, though, is that what matters is not only fairness in pay, but also (maybe even more?) other characteristics of jobs, in academia and elsewhere.